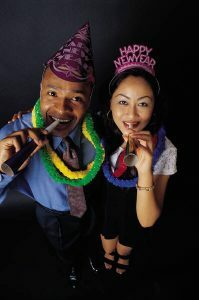 January 23, 2012, kicked off a 15-day traditional celebration of the Lunar – or Chinese – New Year with the new moon. Following suit in the Chinese 12-year zodiac calendar, we have officially entered the Year of the Dragon. For us at East Coast Chair & Barstool, it means giving our China-based manufacturers and friends time off to celebrate and planning ahead for the schedule of our container shipments of tables, chairs, and barstools. But for you – as restaurant owners – it could mean attracting new business with traditional new year recipes, new year – inspired promotions or giveaways, and the chance to cross cultural boundaries and experiment with a new theme! 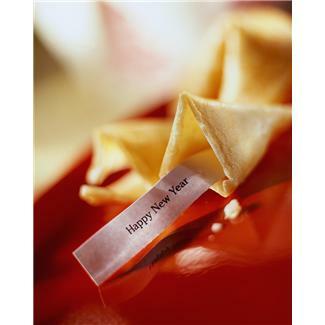 Restaurants and event venues across the U.S. from L.A. to New York City will be adding festivities and special new year menu items, all in honor of the Year of the Dragon. Because it’s a 15-day celebration, you still have time to plan something big for the Lantern Festival on the 15th day, or you could introduce a dragon-themed menu item(s) for the duration of 2012! Get creative, as the possibilities are endless! Happy Chinese New Year to you, and best wishes for a festive Year of the Dragon! When choosing the right bar stool for your bar or restaurant, you may be wondering if you should choose a swivel bar stool or a standard bar stool that doesn’t swivel. We know how important having the right restaurant furniture is to you and your customers, so we are here to help. There are numerous options in either a swivel or a standard bar stool style, so here are some pointers to help you decide. Swivel bar stools tend to be easier to get in and out of. This is one huge benefit if choosing the swivel bar stool style. Being able to pivot away from the bar or extra tall table and also out of the way of fellow patrons on either side, the swivel makes it easy to sit down and stand up from the bar. That’s not to say that a standard bar stool should always be avoided, especially if they are placed at high tables where you want your guests to stay seated for longer periods of time. Keep the drinks coming! Swivel bar stools work better in more social flowing atmospheres. It’s all about your brand and the atmosphere you way your bar or restaurant to portray. 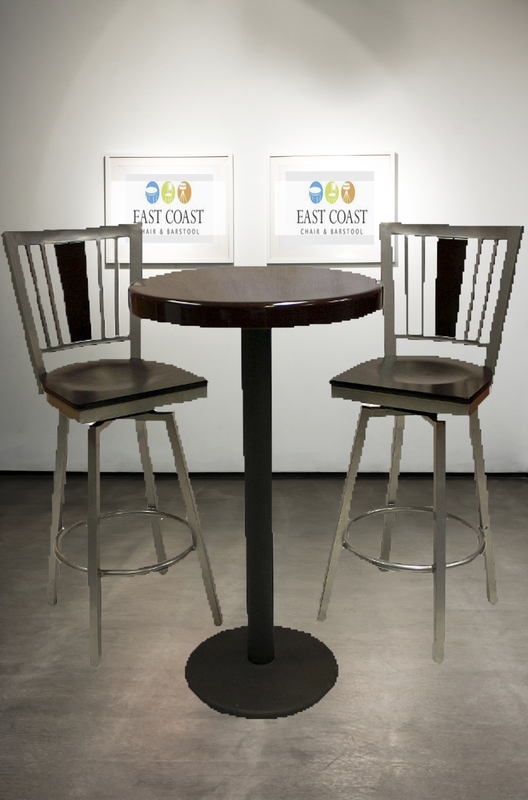 If you are a social bar where singles are mingling, then a swivel bar stool is your best choice. Movement allows patrons to scan the room, get in and out easily, turn to talk to different groups of people, etc. However, if you are a restaurant trying to create intimate dining experiences or more private spaces for your guests, then a standard or non-swivel bar stool is the one you want. Your patron parties will appreciate the stationary seat when leaning in to talk to one another at their same table or next to them at the bar. Swivel bar stools may feature a taller seat height. It’s true: size matters. When choosing your bar stool, make sure you get one with the right seat height. Most bar stools are about 30″ tall at the seat, but a swivel may or may not add an inch or two to that height. Always check the dimensions and give your guests enough room beneath the bar/table and above their knees. Comfort is always key in choosing the right bar stool. Choosing a swivel bar stool means choosing metal. If you are trying to create a more traditional, warm, classic feel in your restaurant, a wooden bar stool may be your best bet. Unfortunately for wood-lovers, most swivel bar stools come in metal. So if you’re looking for wood, you will probably have to choose a standard or non-swivel bar stool. That’s not a bad thing! Solid wood bar stools offer a timeless elegance to your bar or restaurant. Once you have a clear brand image, choosing the right bar stool will make total sense! Perhaps, it will be love at first sight – and you will just know when you see that bar stool that is calling your name. Whether you choose to swivel or not, selecting the right bar stools for your bar or restaurant will be a great achievement. Do you have other tips to offer to this conversation? Share them with us and our readers by commenting below! 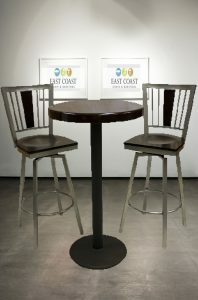 Posted on Jan 16, 2012 in Design and Furniture Selection • Comments Off on Should Your Bar Stools Swivel? In an ever-changing world with new technologies emerging every day and societal pressure to be new, fresh, and different, it’s amazing to realize that today’s most preferred and prestigious event chair was designed over 200 years ago. While there have been many improvements to the Chiavari chair to modernize or add an updated twist to the overall look, the classic and traditional style has proven its timeless appeal. That’s why I thought I’d dedicate this entire article to Chiavari chairs! 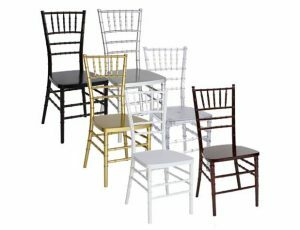 When should I use a Chiavari chair? How can I dress up my Chiavari chair? Designed by Italian craftsman Giuseppe Gaetano Descalzi in 1807, the design was modeled after chairs brought to Descalzi from Paris. With a goal of creating a lightweight, yet functional, chair with a highly elegant style, Descalzi gave birth to the Chiavari chair. Descalzi, whose nickname was “Bell Ringer,” was praised for the durability and beauty he achieved in his design, which far exceeded the Parisian chairs in which he modeled his design. The Chiavari creations weighed less; plus, Descalzi’s chairs were stronger and held more weight. The elegance functionality of the chair soon grew in popularity, and thus, a multi-century trend was fashioned. Since its inception, the Chiavari chair has seen numerous variations and versions, but quality has been at the helm of every Chiavari chair’s maker. Although you may call them ‘chivari chairs’, the correct spelling of Chiavari chairs comes from the town of Chiavari in Italy where the styling was first created. So while you may refer to them as chivari chairs, proper spelling is Chiavari (shi-var-ee). In some instances, you may hear them pronounced kee-ah-var-ee, from the Italian pronunciation of the town Chiavari. It’s not a brand name, and many manufacturers make their own Chiavari chairs. You may also hear them referred to as Tiffany Chairs. Tiffany Chairs is just another term for the same type of chair as a Chiavari chair, given so to acknowledge the prestige of the design. Because of the popularity of their use at weddings and wedding receptions, still others may refer to Chiavari chairs as “wedding chairs.” No matter what you call them, a Chiavari chair is highly recognizable to many. Chiavari chairs have many uses, and because of their versatility, many banquet and conference centers have decided to have them on hand for all of their special events. 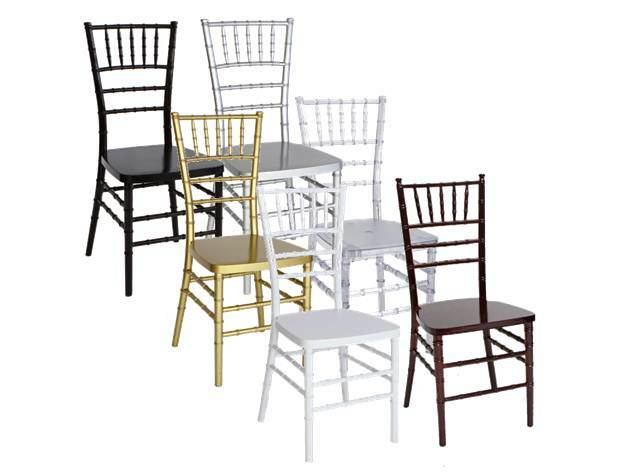 While, as a generalization, these chairs are somewhat inexpensive, the Chiavari chair is also quite versatile – acting as the perfect fit for any type of function or occasion. From weddings to corporate events, casual get-togethers to audience seating, Chiavari chairs afford one the ability to accommodate any type of audience at any type of function. Both timeless and multifunctional, these elegant chairs provide versatility, ease of use and storage, and the ability to customize their look to the desired event. Although most often given as a seating option for larger gatherings and special occasions, the Chiavari chair is a practical, interchangeable, and decorative accent – or feature – for almost any space. They do present a touch of class and are often used for more formal gatherings, but with their simplicity in elegance and their lower price tags, Chiavari chairs offer a great seating solution for everyday events. The good news is that the Chiavari design is now reaching new heights! Have you seen a Chiavari bar stool? They are also taking on more color; see this one in a transparent sapphire, and tell me how fun it would be to set up an event with a selection of these! So the answer is – use your Chiavari chair all the time, whenever your heart desires! There are plenty more creative ideas on how to make your Chiavari chair stand out. What’s great about a Chiavari chair, however, is that they are so beautiful on their own, that choosing Chiavari for your event or venue already makes your chairs stand out, so you can focus the rest of your decorating energy on other elements, like the centerpieces. I hold strong on my statement about using Chiavari in your everyday. You don’t need to wait for a special occasion to enjoy the classic design of these elegant chairs. Use them as your restaurant dining chairs, choose a resin Chiavari chair for your porch seating, or offer them for all your conference or theater-style seating. However, if you’re about the glam and want to know if famous people use these chairs, the answer is yes! A popular choice for TV host and wedding planner, David Tutera, these chairs are all the rage in celeb special events. Carrie Underwood, Bethenny Frankel, and countless other celebrities have used Chiavari chairs on their wedding days, and when John & Jackie Kennedy were married, they had Chiavari chairs, too. They’ve been shown on movie and TV sets, and many famous and not-so-famous modern brides alike are requesting these chairs from their wedding venues with all the well-deserved hype surrounding Chiavari chairs. Whatever your individual preference, it’s clear to see: Chiavari chairs are here to stay. They are one style statement that isn’t going out of fashion any time soon. A few days ago, we watched the ball drop. Toasts were shared. Resolutions were set into place. And 2012 is now officially upon us. Is your restaurant ready for what the new year will bring? I’ve put together a list of restaurant trends for 2012 that I hope will get you thinking and help you reach all your new year hopes and dreams. 1. When it comes to design, less is more. We are just a bunch of minimalists. Don’t let the few pat racks in the world that they make TV shows about influence the way you design your restaurant. If you have shelves of dusty knick-knacks, it’s time to reinvent your image. Anything you put into your restaurant design needs to celebrate your theme and brand; if it doesn’t, it should go. Be picky when you choose your color scheme, artwork, lighting, and overall look of your restaurant. If you are sports bar, then sports memorabilia is OK. But if you are a modern, American family dining establishment, retro Hummels on a shelf probably aren’t doing anything for you. Today’s consumers want to see shiny, germ-free, clean, and clutter-free surfaces. The good news is that it doesn’t take a lot of money or a complete overhaul to accomplish this design task. Not sure what to do with empty shelves? Why not turn them into functional space by storing wine bottles, dessert glasses, or pretty pieces of fruit or veggies? –>We also recommend some contemporary tables, chairs, or barstools! In keeping with the less is more idea, how about an aluminum table and base set, our simple cross back metal restaurant chair, and/or the new Z stainless steel bar stool. 2. Nutrition is important. While not everyone who goes out to eat cares about the number of calories they are over-indulging in, the fact remains – some people do care. And that number is growing. Balance your menu with the “I’ve been good all week, so I deserve to stuff my face” items with the “I want to keep my jeans buttoned on the ride home” items. Make it easy for smart eaters to find your healthy menu items, and be sure to make all the label-readers happy by listing out nutrition/caloric information by those menu items. It’s good practice to be transparent, and your health-conscience consumers will feel at ease knowing exactly what they are putting in their mouths. A growing trend is also creating more healthy side options for children. Don’t just give them chips or fries; offer their choice of a salad, vegetable, or fruit. Don’t forget to list the kind of milk you serve (is it skim or whole? ), and be sure to choose juices with low sugar content. If your kids’ menu is filled with fried finger foods, consider adding some healthier options or creating smaller portions of your regular, adult menu items, like many restaurants do for senior citizens. As long as you don’t expect the children dining at your restaurant to eat liver and onions, you should be able to make both child and parent happy by finding that intersection of nutritious and delicious. 3. Minimize your desserts. Think about the dessert shooters at Applebee’s or the collection of mini desserts at PF Chang’s. Everyone loves a burst of sweetness at the end of the meal, but if you’ve already served them an appetizer, salad, and main course, they are probably close to skipping dessert. If you can offer them a small but satisfying treat, you are more likely to make that up-sale, and they are less likely to feel guilty about ordering dessert. It might not be so much about nutrition for your “I’m so full, I don’t know if I can walk to the car” guests, but creating a few mini-sized desserts on your menu will pay off for you in the long run. 4. Buy local. When possible, buy local produce, fresh ingredients, and otherwise support local business by using local vendors for your purchases. Then, don’t forget to tell your customers that the tomato on their sandwich was grown at Farmer Bob’s down the street, that the buffalo-turned-bison-burger was raised on the outskirts of town, and that you support the local fishing industry. Consumers love to feel good about frequenting a business that cares about the same things (and people) that they do. So if you are supporting other local commerce, they feel as if everyone is doing their part to boost the local economy and help their neighbors out. You many consider adding a local or regional section to your menu, as well, and feature foods that are staples in your neck of the woods. For example, where I come from, it’s not uncommon to see ox roast, pepperoni balls, Lake Erie perch, or Pittsburgh-style slaw sandwiches on a restaurant’s menu. 5. But when it comes to menu, don’t be afraid to go global. While consumers, who are still shell-shocked from the recession, are not going to want to take a lot of risks in 2012, offering some exotic-but-not-too-exotic menu choices to show off your global culinary expertise will help you compete with your fellow restauranteurs. But don’t go too daring. Just add a little Asian or Indian influence in your cooking, or try some borderline unique ingredients, such as coconut, pistachio, or mango. 6. Cook, don’t just heat. Chain restaurants, especially, are notorious for ‘heating’, ‘unfreezing’, and ‘scooping’ their pre-packaged meals (sent from a faraway headquarters) onto their guests’ plates. Adding just a few homemade items, made-to-order menu choices, or house favorites can go a long way with meeting consumer expectations. As cooks and foodies alike get more savvy, bringing more of the prep and cooking in-house will prove to be a wise choice this coming year and into the future. Empowering your kitchen staff and training them to make some of your signature dishes can prove to be a successful HR strategy, too. 7. Promote sustainability. Have you gone green? Do you use recycled paper for your menus? Can you grow your own herbs for cooking at your establishment? Are your light bulbs and appliances all energy-saving products? This is a trend that we will continue to see grow in 2012, so being able to not only market your restaurant as such but to reap the economic advantages of being sustainable will be beneficial for your own business’s growth and prospering. –>Looking for some furniture that shows off your sustainable values? I recommend our poly lumber tables, made 100% of recycled materials, which are good for indoor or outdoor use! 8. Listen to your customers more/better. In the age of social media, customer reviews, online surveys, and let’s face it – a lot of chatter about where people go, how they spend their money, and what they expect, it’s crucial that every business owner or marketer listen and respond in the form of improvement and action. You may even want to jump on the bandwagon of giving discounts to customers who complete surveys, start your own restaurant Facebook page, offer a social deal of the day, or start tweeting your restaurant news and events. Whether you want to join the online conversation or not, you should at least listen in when people are talking about you. Be prepared; you may hear some complaints. Don’t let that discourage you, anger you, or turn you away from those conversations. Instead, use your customers’ advice to create a better product, atmosphere, and well-liked restaurant. More than ever, it’s easy to collect customer feedback, so take advantage of those channels and listen closely! Savvy marketers, like mega pizza makers at Domino’s, can take hard-heard truths and turn them around into positive marketing…and better pizza! Facing 2012 head on by making a few adjustments to keep up with these restaurant trends is a great new year’s resolution for any restaurant, whether you are a casual family diner, formal fine dining restaurant, or small cafe. Your friends at East Coast Chair & Barstool wish you a very happy new year!